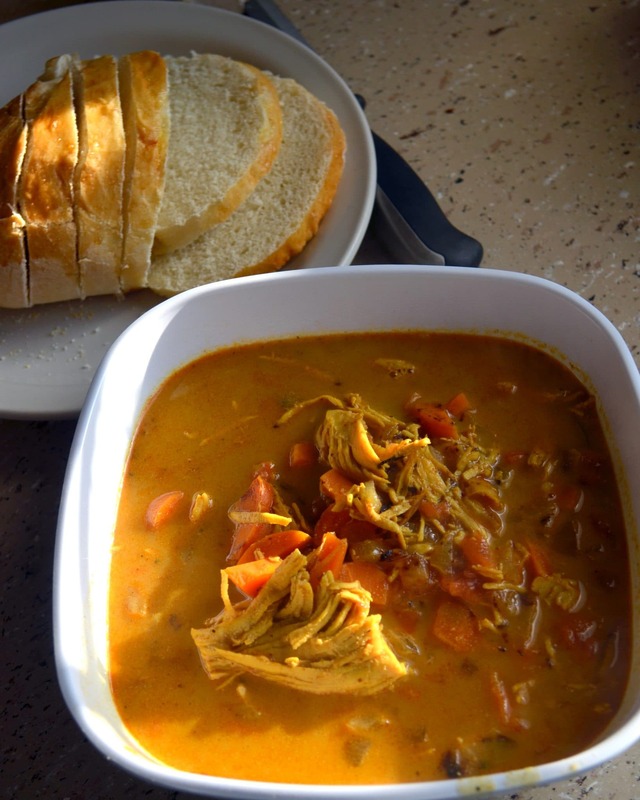 This chicken curry soup is packed full of vegetables, shredded chicken, and so much flavor! I’ve been eyeing this recipe on Pinterest for a little while now. Ever since about a month ago I asked for suggestions on what I should make for dinner, and you gave the suggestions of: fresh soup and salad, veggie centric, and grilled chicken with cilantro cream sauce (Which sounds amazing, by the way). Anyway, since that day I was looking at the soup recipes I’d pinned and couldn’t get this one out of my head. It’s pretty healthy too, considering its got vegetables and chicken, chicken broth to add some sodium and its only got a little bit of whipping cream to add fat. Besides, even if its not as healthy as a traditional chicken noodle soup, its absolutely delicious and you should totally make it. Ps. I don’t really know how to describe the flavors in this soup. You don’t actually add curry spices to the soup but everything together comes out to be curry-ish. And I think I’d say its a carribean kind of curry (if that even exists – because it reminds me of flavors when my friend made curry and we had it with plantains and beignets). 1. In a large pot, saute onions and carrots in olive oil until soft. About 10-15 minutes. 2. Add the garlic and ginger powder and saute another 1 to 2 minutes. 3. Add the tomato. Add the spices. Cook for 2 minutes. 4. Add the shredded chicken and stir well. 5. Add the chicken broth and over medium heat bring the soup to a simmer. Simmer the soup for about 20 minutes. 6. Stir in the whipping cream. Enjoy. Its good with a side of bread, and would be great over fresh rice also. That looks awesome. I like the idea that there is no curry powder in the recipe yet there is a curry taste, so you basically made curry from scratch. My girlfriend will be very impressed. YUM! this looks sooo good. I have been craving curry lately! I’d be thrilled if you shared this over at Whatcha’ Whipped Up . Hope to see you there! You joined My Sweet Party in May and in a few days I’ll feature my top three favourites. So make sure to visit soon to see if your recipe was one of my favourites. Today there’s a new month and a new theme. I really hope you’d like to join again! Please make sure to link back to my blog.